Mexican Beef, Bean and Corn Tostada, my first contribution and participation for Cinco de Mayo ((pronounced: [ˈsiŋko ðe ˈmaʝo]; Spanish)) celebration on the 5th of May. Just for the curious mind and the history geeks, wiki gives an overview of what Cinco de Mayo is all about. 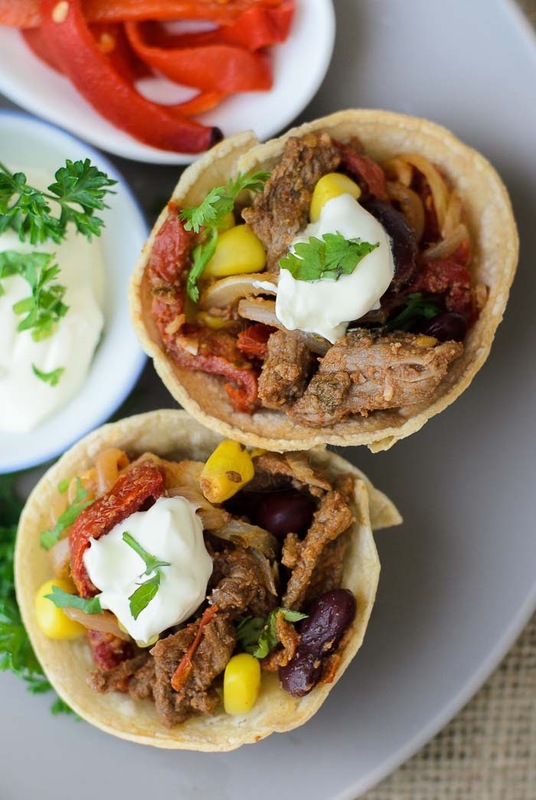 Mexican Beef, Bean and Corn Tostada, is an old recipe from an old recipe book. that I tried twice before. When there are many recipes to try, I 'kind of' forgot about this Beef tostada! Flipping through that old recipe book again, a sudden rush of feeling of "Yeah, its been a while since I made this :D". My first cooked out was in late nineties, I was still residing in Kuala Lumpur, Malaysia. One or two ingredients, I can't remember which now, that I could not find them in our local grocer/ supermarket. Mexican food was not 'hip' (I swear my kids will roll their eyes at me using this word) in those days. The nearest Mexican food we could get, perhaps at TGIF, tacos came to mind! My second Mexican Beef, Bean and Corn Tostada, was perhaps...over a decade ago. I remembered then... how I painfully tried to make the tortilla 'baskets' with folded aluminium foil, failed attempt!!! But I served the tostada anyway. Kids were so thrilled to have their dinner served in an edible bowl that they did not mind the shabbiness, not perfect tortilla baskets. My third Mexican Beef, Bean and Corn Tostada, still not perfect! For the tortilla baskets, I used muffin pan! hold its shape but needs lots of trials to get that nice flat bottom shapes :P.
I am putting up a note for my future reference! To use flour tortilla instead of corn tortilla. 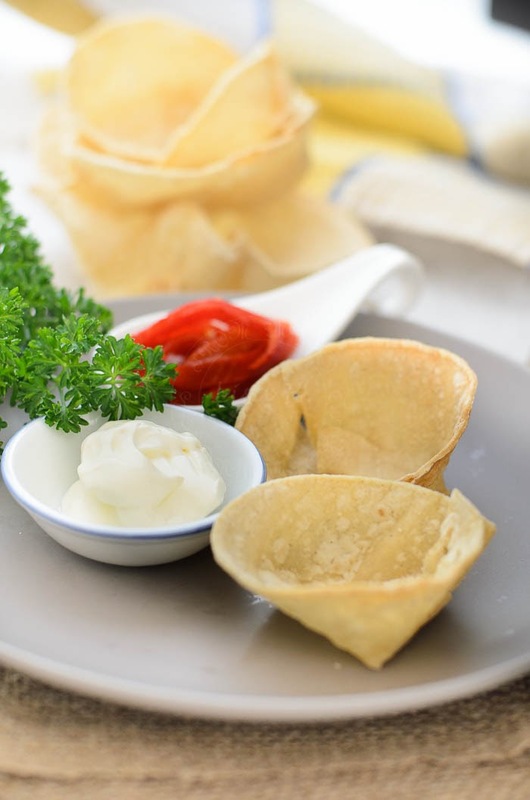 Corn tortilla became hard and chewy, once it has cooled down! 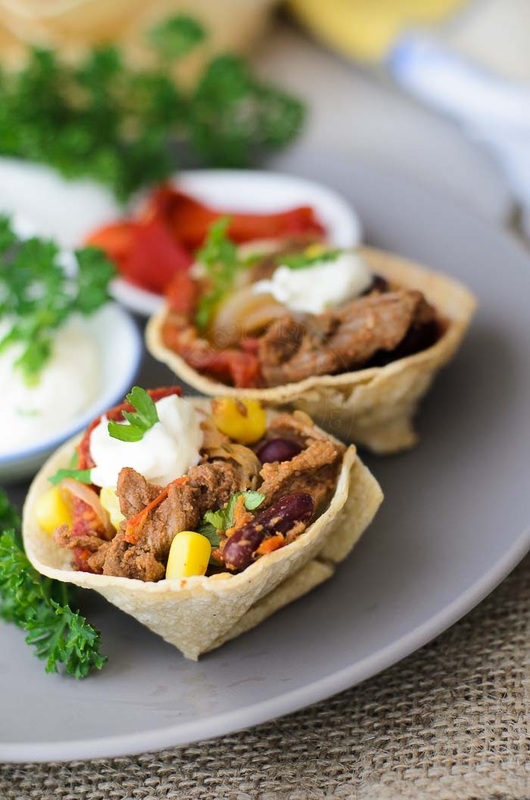 Mexican Beef, Bean and Corn Tostada served in tortilla bowls. Mexican beef tostada made from fresh ingredients. Mix beef strips, oregano, cayenne pepper, ground cumin, garlic, tomato paste and lemon juice. Heat 1 tablespoon oil and cook beef in batches until brown. Remove from pan. Heat remaining oil. Saute onion until just soft. Add capsicum strips, corn and beans. Coat tortilla with cooking spray. Gently push into mould (use either muffin pans or oven proof glass bowls). Bake at 180C for about 15 minutes or until just crisp. 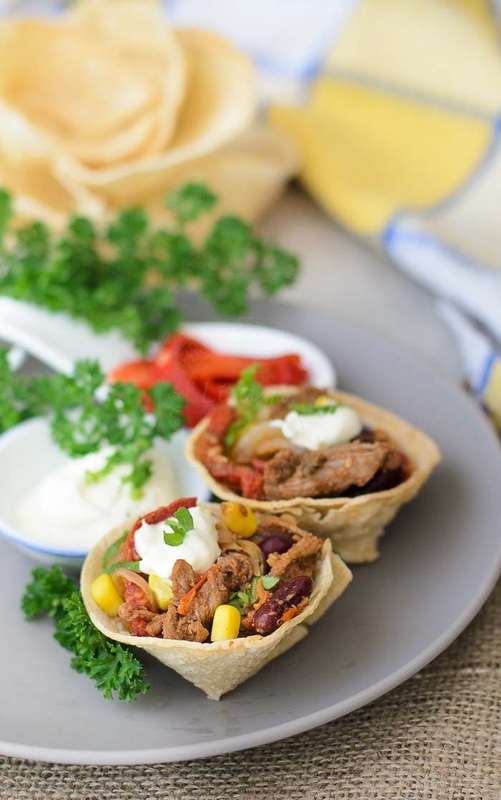 Spoon warm beef into tortilla baskets. So delicious! I love corn tortillas, so any time I can use them is fantastic. Plus, this is a great alternative on Taco Tuesday!